Located at the end of the Sansad Marg, the Parliament House or Sansad Bhavan is one of the most impressive buildings in New Delhi. 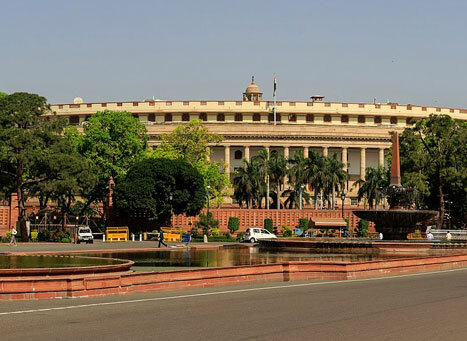 The Parliament House comprises of a central hall which is circular in shape and is considered to be very important part of the building since this is the place where the Indian Constitution was drafted. The Parliament houses the Lok Sabha, Rajya Sabha and a library hall. There lies a garden in between three chambers. Not just this, but Parliament House also has the facilities for the accommodation for the ministers, the important officers of the Lok Sabha and the Rajya Sabha, Chairman and Parliamentary Committees. With the aim of educating people on Democratic Heritage of India, The Parliament House also houses a museum which dates back to 2500 back and is set up in a very interesting way and is made complete with light videos and sounds, large interactive computer screens and others. Constructed in the Imperial Style, the Parliament House consists of an open verandah with around 144 columns. The Parliament House was designed by British architect Edwin Lutyens and Herbert Baker. The foundation stone of the building was laid by the Duke of Connaught in the year 1921 and the iconic building was inaugurated in 1927 by Lord and Lady Irwin. Except Sunday and Monday, one can make a visit to the Parliament House between 11:00 AM to 5:00 PM. The entry to the Parliament House is between INR 10-15. However, it is free of cost for the children. Though the Parliament House can be visited at any time of the year, winter season remains favourable as the weather is pleasant. Once you are through with exploring the Parliament House, move ahead exploring the other tourist spots in Delhi which is visited by tourists all throughout the year. Located at a distance of 2 mins away from the Parliament House, a visit to Gurudwara Rakab Ganj Sahib can be made to seek blessings. A visit to The All India Fine Arts & Society which is located at a distance of 3 km can be made which takes one to India’s most prominent and independent Art Organisation. National Philatelic Museum which is located at a distance of 2 km from Parliament House would take you to a place of rare collection of various stamps, including the first one issued in the year 1854. Located at a distance of 2km, a visit to Mughal Garden would take one to the Mughal style with the British architecture, designed by Sir Edwin Lutyens for Lady Hardinge. One needs to get down at the Central Secretariat Metro Station which is on the Yellow Line to get to the Parliament House.